My sweet baby Grandson, you have filled my life with joy and amazement. I wish you another year filled with growth, learning and limitless happiness. Grandson, when you were on your way to us, I knew that I would love you, but I had no idea of the thrilling depth of that love. Happy Birthday, sweet boy. Happy Birthday to a Grandson who’s as rough and tumble as a grizzly, playful as a monkey, and lovable as a cuddly puppy. We love you! Yo, Grandson home slice! Digits on the calendar flyin’, you are Birthday high fivin’, birthday cake is the proof, let’s party and blow off the roof! Dear Grandson: There’s not a gift box large enough to hold all the love I have for you, so I’ll just give you a birthday present and tell you I’m so proud of you. Official Birthday Proclamation: By the power vested in me, you are now bestowed the title of “Best Grandson In The Universe Award” for goodness, fun, merriment, and general love-ability. From the time you were a baby until now, you have made our lives so much more meaningful, Grandson. Hope you have a great Birthday! I never realized how, year by year, having a Grandson like you would improve my world and make every milestone worthwhile. Thank you and Happy Birthday. It says in the Bible “… children’s children are the crown of old men…” As I wish you Happy Birthday, Grandson, I thank our Heavenly Father for crowning my life with YOU. It’s your Birthday, Holy Cow! 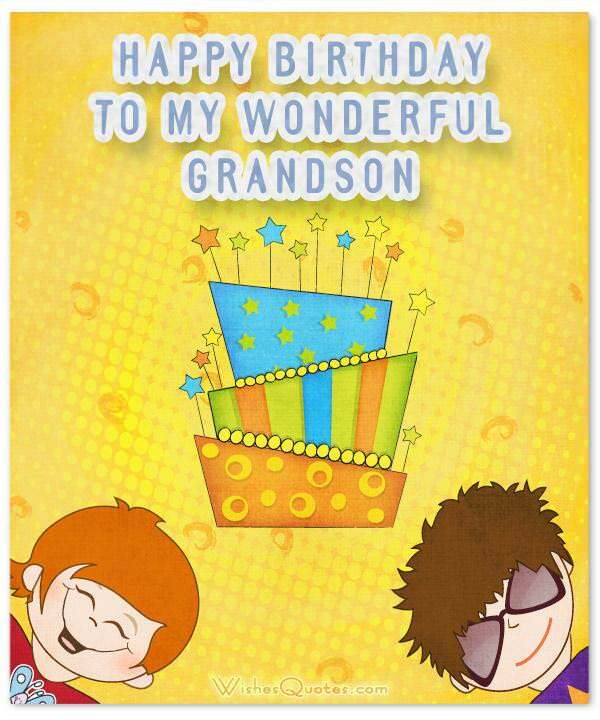 Cake and presents, you’ll say “Wow!” Good boys are born on this date, like YOU, my Grandson, you’re truly GREAT! Roses are red, your jeans are blue; Candy is sweet, and so are YOU! Happy Birthday to the most lovable Grandson EVER! 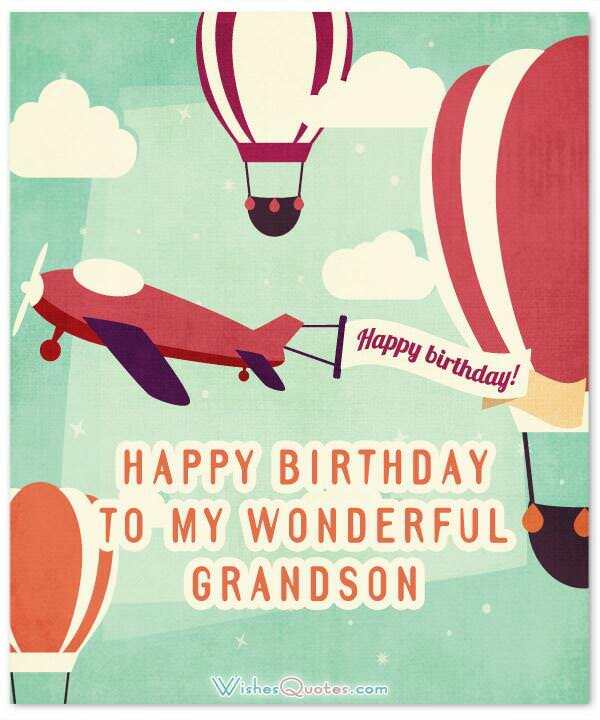 It’s time to BLAST OFF to the most awesome, time-warping, intergalactic, planet spinning, launch pad exploding Grandson Birthday known to man! Grandson, some people think you deserve a cake or gifts on your birthday. Others think you deserve balloons and singing. Not me. I think you deserve ALL of those and much more! It’s no surprise to me, Grandson, that you’ve grown into a handsome young man with a strong character. You’ve always made us proud. Happy Birthday. AARRGGHH! Raise the mast and hoist the sails. We’re about to set sail on another year of swashbuckling adventure on the high seas. Happy Birthday, Matey, er, I mean Grandson. You may not be the standard Grandson, but then, I’m not the standard rocking chair Grandma either. All I know is, on your Birthday, I’m glad we don’t have a standard relationship — it’s much better! You may be a typical boy, made of tricks and snails and puppy dog tails, but to me you’re still the sweet little baby Grandson I held in my arms so long ago. Happy Birthday. If I had the ability to turn back the clock to the time you were a little baby, Grandson, I wouldn’t do it. On your birthday, I want you to know how I’ve enjoyed watching you grow and amaze! Instead of a “Happy Birthday, Grandson” card, I decided to give you a “Thank You” note instead because I’m so grateful for you. Grandson, on your birthday, we not only wish you a bright year ahead, but also a year full of FUN and adventure. Enjoy it! Grandma and I decided that you’re too old for the birthday smooches and plastic toys, so this year we’re just going to let you pick out your own gift as we send our love. Maybe Grandsons were sent to Grandparents to keep them on their toes. You do make us feel energetic, young, and full of amazement! Happy Birthday. Just as the mark on our wall showing your height gets higher every year, so does our love and respect for the best Grandson in the world. Happy Birthday! Happy Birthday Grandson, and thank you for giving us the chance to be better grandparents than we were parents. We love you. Birthday wishes are fairly easy to produce for a mother, daughter or friend. However, birthday greetings sometimes fail us when it comes to a grandson. For the little tiny grandson’s birthday, we want to make certain the words will resonate years from now, as this note or card will undoubtedly be enshrined in a baby book. Teenage grandsons pose particular problems as well, not due so much to posterity, but to the sensitive nature of that age group. Most things that grown-ups say receive an eye roll, making a mushy message far too embarrassing, but the pressure eases somewhat as they become young men. Whether delivered electronically, accompanying a gift, or just as a note, we want it to be heartfelt. 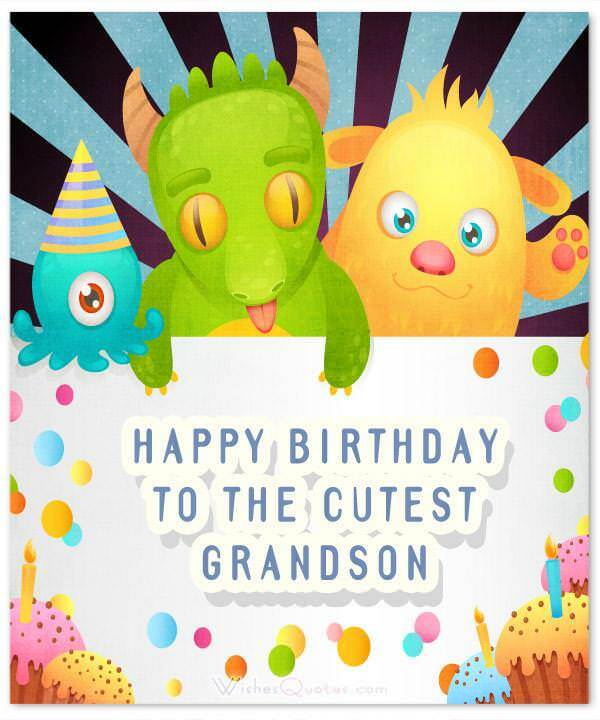 Below are some examples of unique and cute grandson birthday wishes that, when tailored to your own relationship with your grandson, will let him know how much you care.